Our New Privatized In Home Training Classes are truly unique in the Firearms/Self Defense world and simply put, there are no others in Southern California like us. The purpose of this training is to prepare you for the initial reaction and the few minutes of lag time. The lag time between the Police receiving the call and arriving at your house is extremely dangerous and frightening. This is where our training comes in to best prevent any harm to yourself or your family. We bring all of the training equipment for you, your family, friends or groups in your own comfort zone. In our training, we use non-lethal man-marking cartridges that are fired from real guns and it is the most reality-based training available. We will fully discuss how the training will be customized for your peace of mind and how we will protect your home minimizing any aesthetic damage during our training until you are 100% comfortable. 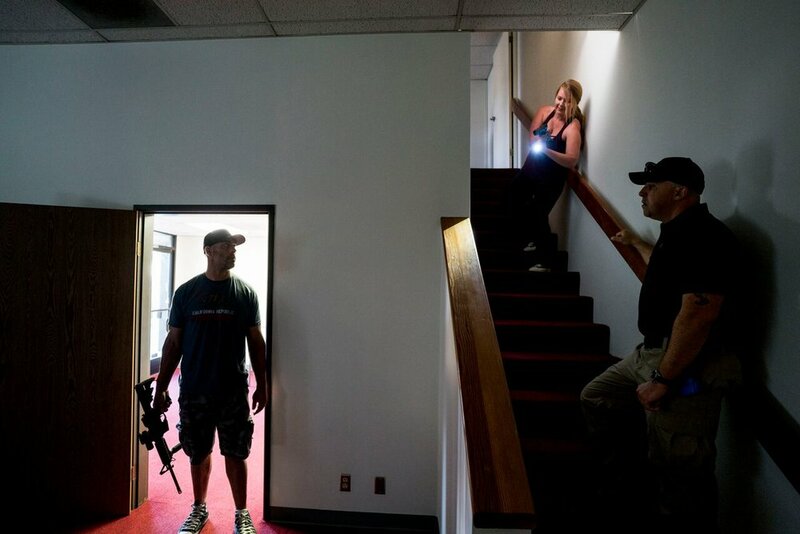 In our classes you will learn legal, efficient communication to 911 dispatchers, a variety of shooting techniques and tactics, hand to hand/ground defense as well as medical aid for gun shot wounds/knife wounds and much more. In addition we teach our students how to properly respond to a break in and what to do for safety when Police arrive. This is extremely important and commonly forgotten in other training. In our classes, we also immerse our students into real-life scenarios within your home environment. In these scenarios our students will put what they learned to the test when they encounter our role-players who are portraying and utilizing current trends/methods used by criminals in our local neighborhoods. This training is extremely safe with easy going protective equipment to provide the best experience for our students. In our training you may or may not decide to shoot our human role-players who are on the move as if it were the real thing. Other training centers provide the Virtual Reality Simulators which are great uses for training however, that training is based on a large video screen(s) with no actual human movement and interaction. Our training is now the most current reality-based training available to civilians outside of Law Enforcement and Military Special Units. We have adapted all of our knowledge, experience and training for civilian use in self defense. It truly is as close as you can get short of the real event taking place. You will learn Basic Firearms Safety, Firearms Shooting Skills (yes you will shoot some guns), legal (when can you shoot or not shoot), an American Tactical order of process to address a break in, basic tactics (how to clear your house and move through rooms/doorways) and will be immersed into a real life Home Invasion Scenario (Night time). You will use what you learned and utilize our real guns with non-lethal training ammunition. We start with a refresher training from Level 1. Then you will learn intermediate tactics (how to move down hallways either alone or with another person), advanced firearms handling, and 2 Home Invasion Scenarios (Daytime and Night time). You will learn how to address any gun shot wounds, knife or slash wounds and blunt force trauma wounds. This course incorporates the use of tourniquets, chest seals and practical items around your house that will assist you in treating yourself or family members until the ambulance arrives. You will have 1 Home Invasion Scenario with a medical aid need. You cannot make anything more real life than this scenario as there will be force on force. What does that mean? You may be shot with our non-lethal training ammunition. Men/Women/Family: Do you feel vulnerable at home alone during the day or night? Have you ever though about self defense classes or any other training? Is your protector on a business trip or working a late shift? Or do you realize that you can be your own protector. Please, stop thinking and come in to receive the highest regarded, current training military and law enforcement use. We want you to have the confidence, ability and peace of mind that this training provides so you can protect yourself and your family. American Tactical Defense, even when there is the most intimidating threat in your house, you will still win the fight with our training.